I knew The Umstead Resort and Spa wasn’t your typical hotel when the parking valet was so good-looking, it was like he was kidding. I mean, seriously, when was the last time the guy who parked your car looked like a square-jawed, blue-eyed, muscle-bound, Abercrombie and Fitch model? (With a shirt on, but still.) Clearly, The Umstead had high standards for everything. But I’m getting ahead of myself. How did a NY Blogger end up spending a weekend in Raleigh, North Carolina during the hottest month of the year? I won a trip! The Greater Raleigh Convention and Visitors Bureau had a blogger event in NY several months back, and I won an all expense paid trip for two to Raleigh. I was the dummy who chose August, but it’s a testament to the city that despite the heat (and it actually wasn’t all that much hotter there than it has been here in NYC), we had a fantastic time. Due to this weekend’s crazy weather, our flight down was delayed nearly 4.5 hours. So instead of spending the afternoon in the Umstead’s 14,000 square foot spa enjoying the massage/facial package I had booked, I spent nearly 6 hours in Newark Airport. I cannot tell you how bummed I was. I mean, think about it for a moment: massage – Newark Airport…facial – Newark Airport….soothing atmosphere….You get the picture. Raleigh, I thought, had better be worth it. The Umstead’s hunky valet was a good sign. As was the lake view from our very spacious (500 square feet) room, and the perfectly warm, friendly, yet not over-the-top (are you listening, Ritz Carlton?) service and staff. The fact that I left my Hotel Gift Certificate at home was handled with grace. (At least by them. I wanted to die!) And after a quick freshen up, we headed to Tribeca Tavern in Cary. (Part of the Great Raleigh Area). 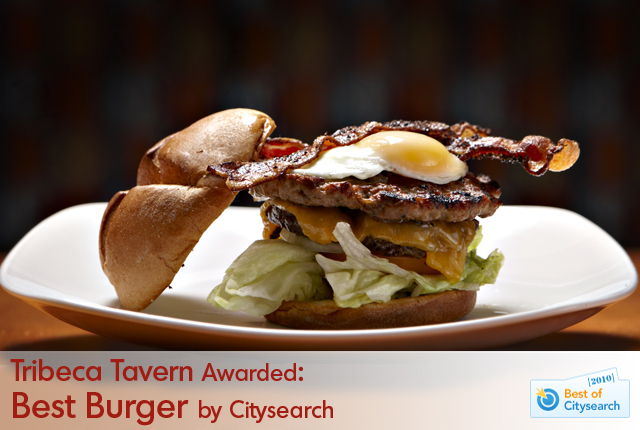 Tribeca Tavern is a giant place, where no entrée is more than $15. So “I don’t think we’re in actual Tribeca, anymore, Toto” would seem to apply. The restaurant uses locally sourced meat, produce – even bread and pickles – in just about everything it serves. Love that. My husband had a Kobe burger – they are famous for burgers – and it was, hands down, one of the best burgers ever. I had a turkey burger (Dr. says I need to watch my cholesterol — way to make me feel OLD!) and it was not ONE of the best – it was THE BEST turkey burger ever. Seriously. Moist, tasty. I probably don’t want to know the fat content. But man, was it good. Raleigh was looking promising. And it was only the first night. So glad you enjoyed my home state and The Umstead! So glad you enjoyed my home state and The Umstead too! Try An restaurant across the road…fabulous Vietnamese fusion food and drink!